eCBA evaluation projects is intended for all entrepreneurs such as freelancers, small and medium sized enterprises or large companies. The application is also suitable for municipalities, non-profit organizations, regional development professionals or grant agencies. The application outputs a complete feasibility study (business plan), that can be helpful for the further decisions about the project, or it can be useful as an appendix for submission of the grant application, bank credit or business cooperation establishment. Application methodology is based on cost-benefit analysis (CBA) complying with principles and procedures defined by United Nations Industrial Development Organization (UNIDO), World Bank (WB) and European Commission (EC). The application leads its users step by step through the project evaluation process or business plan creation without necessity to be deeply skilled in economics. Results indicators are presented and interpreted in graphs and charts. Default values of key inputs and variables are available for less experienced users. Detailed help explaining all technical terms is also an integral part of the application. The application eCBA is designed for the professional use. 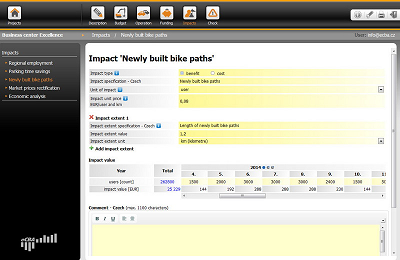 Input variables and parameters can be adjusted easily according to type of the project or evaluation purpose. The application environment and functionality available can be adjusted as well. The scope or depth of the analysis, cash-flow detail (month, quarter, year) and many other parameters can be selected in the settings. Standardized indicators such as net present value (NPV) or internal rate of return (IRR) are used for project evaluation. eCBA application is an online tool available from any type of device connected to the internet. The user interface is designed and optimized for intuitive user-friendly control. Data is encrypted and stored in the cloud, communication with users is secured by verified certificates. Application is composed of folders representing individual sections of the project (business plan). Folders order reflects logical proceedings of the business plan or project evaluation process. Basic project information (title, investor, project schedule, settings) and also project technical analysis details (market analysis, project team, technical aspects, risks analysis, etc.) are defined in this part. List of all costs in the project implementation phase. Each budget item is described in detail (title, decomposition, character, economic life period, conversion factor, etc.). Detailed budget recapitulations and overviews are available. Modelling of operating cash-flow, i.e. the project’s operating costs and revenues. 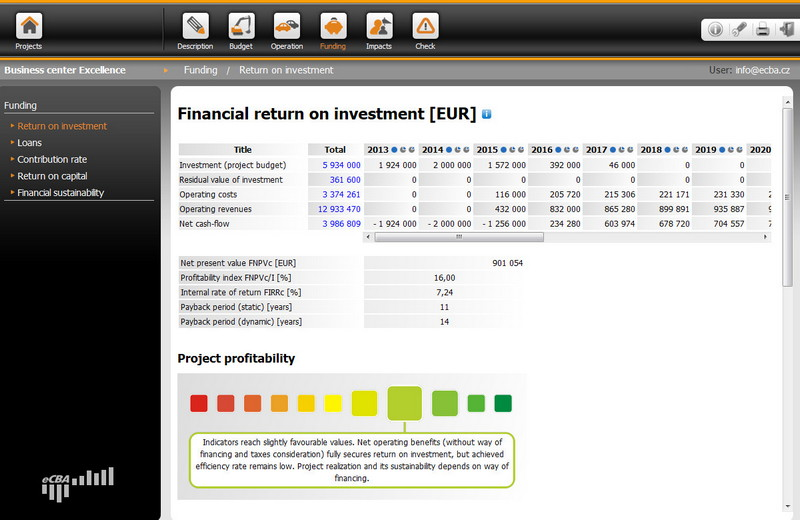 There are functions for easy cash-flow planning available, e.g. making time series or automatic residual value calculation. Identification of funding sources (loans, grants) and overview of financial results (financial return on investment, financial return on capital, financial sustainability). Results are presented with graphs, charts and comments. 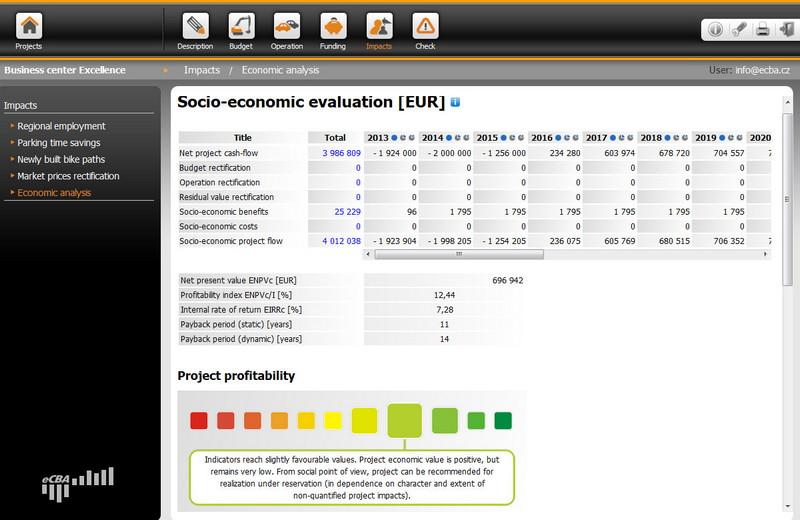 Assessment of the project’s contribution to society (economic analysis). An extensive list of quantified impacts is available (covering the main fields of regional development such as transport, tourism, civic amenities, environment, etc.). It is possible to create user-defined impacts for economic analysis. There is also built-in correction of distortion factors for various types of inputs. Results of economic analysis are presented with graphs, charts and comments. Check and list of formal errors in the project. 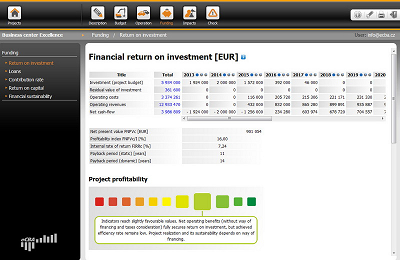 Create professional financial analysis simply and quickly. What will I gain from the financial analysis? financial sustainability, that can be proven even on the basis of the monthly stated cash-flow. Financial results are defined by a set of financial performance indicators: financial net present value (FNPV), financial profitability index (FNPV/I), financial internal rate of return (FIRR), static and dynamic payback period. All results of the financial analysis give an interpretation both graphically and in the form of a brief comment. The evaluation is also extended with a graph showing the dependence of NPV on the discount rate. Net project cash-flow (investment and operating cash-flow) is extended with financial sources represented by debt or grant funding. The application encompasses calculation of the most widely used types of loans (even total payment schedule, even principal payment schedule, single payment schedule) or enables defining an individual payment schedule. 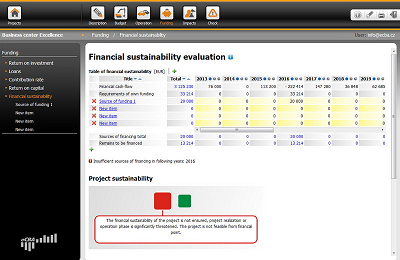 The grant funding option can be activated/deactivated by the user according to the particular project type. Grant funding is prepared in accordance with the principles defined by the European Commission and also allows funding gap calculation. Income tax calculation based on user depreciation schemes is also considered in financial evaluation. 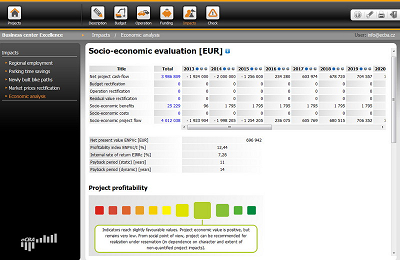 An economic analysis enables you to assess a project’s contribution to society and economic welfare. This is one of the significant features of cost-benefit analysis. For economic analysis, it is necessary to identify all important project impacts in the catchment area. Then, all impacts must be monetised and their values come into calculation of the economic performance indicators. The eCBA application contains a unique set of monetised impacts of regional development projects (transportation, tourism, amenities, environment, etc.). The set of predefined impacts was prepared during the 2007–2013 programming period on the basis of a personal investigation and has been used successfully in the implementation of many Czech operational programmes. 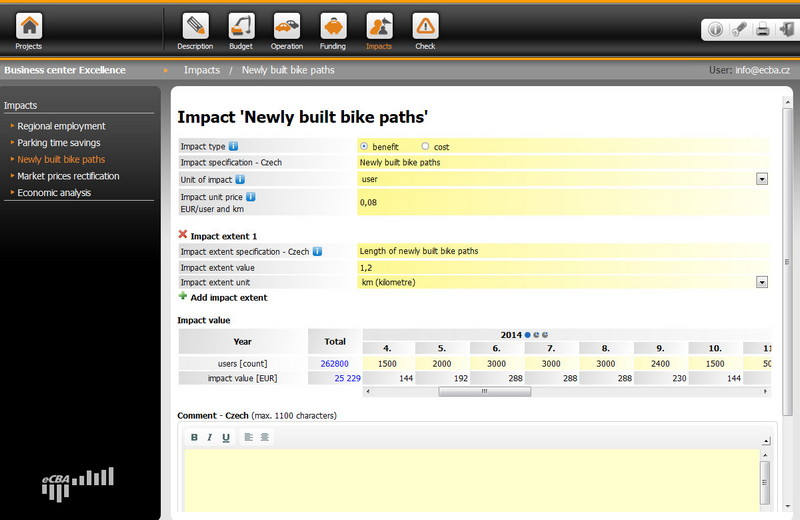 The application also allows you to define impacts for the economic analysis by user. Economic results are defined by a set of financial performance indicators: economic net present value (ENPV), economic profitability index (ENPV/I), economic internal rate of return (EIRR), static and dynamic payback period. All results of the economic analysis give an interpretation both graphically and in the form of a brief comment. Evaluation is also extended with graph showing the dependence of NPV on the discount rate. Watch video presentation revealing basic eCBA application structure, its user interface and intuitive user-friendly control. Full screen mode of the video can be activated by double-clicking on the video player window or clicking on rectangle symbol in the video player control bar.